Spain has taken control of Catalonia's finances to prevent funds being used for an independence referendum it deems illegal, a move that limits the region's autonomy and puts in doubt the payment of thousands of public workers' salaries. "It is a total irresponsibility. They are leading us to an administrative collapse," Catalonia's vice president Oriol Junqueras said Monday, adding the measure was "unprecedented". Spain's conservative government announced Friday it would take over the payment of essential services and public workers' salaries in Catalonia to prevent it from spending money on the referendum slated for October 1. "It is a de facto suspension of Catalonia's financial autonomy," said Alain Cuenca, an expert on the regional financing at the University of Zaragoza who opposes Catalan independence. Spain's regions pay taxes to the central government and are then given a quota to spend on health care, education and public infrastructure. "This means that from now on (Catalan leaders) no longer have their money," said a spokeswoman for Spain's budget ministry. They won't have the right to carry out any "extra expense" beyond those already foreseen, she added. "Does this mean they have less autonomy? Of course! 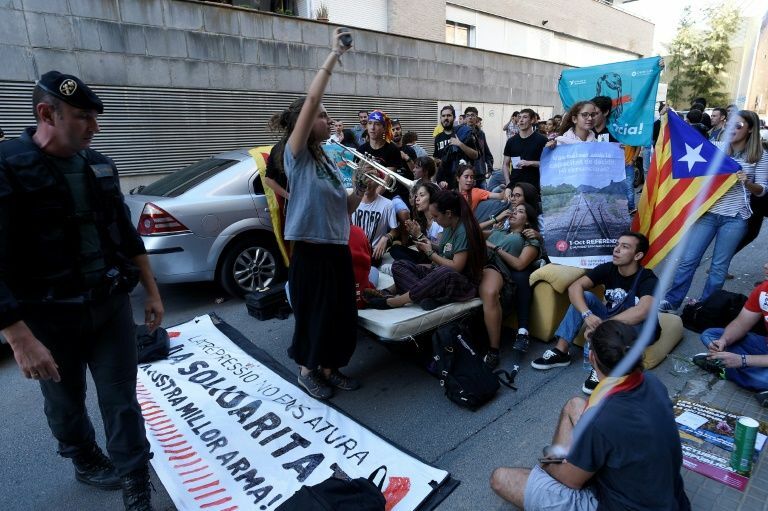 But the seriousness of the measure goes hand in hand with the seriousness of the events," said Francisco de la Torre, a lawmaker with the centrist Ciudadanos party, an ally of Spanish Prime Minister Mariano Rajoy's conservative government. Junqueras said the freezing of the accounts is a disguised way of taking away Catalonia's autonomy, a measure which could in principle only take place after a debate and a vote in the Senate, Spain's upper house of parliament. "This implies not being able to devote one euro to spending in sectors such as industry, commerce, agriculture, livestock, culture, research, sports, youth, social affairs, housing" which are considered to be non essential, he said. Spain's central government will needed their complete details such as bank account info or the number of sick leave days they have in order to calculate the amount they are due. Junqueras avoided answering if his government would provide this information, saying only at a news conference on Tuesday that "we will act with our usual normality". If it does not, Spain's central government will "turn off the tap" of financing for the region since this means the Catalan government "is not cooperating, that they don't want the salaries of public workers to be paid" by Madrid, the budget ministry spokeswoman said. Joan Escanilla, president of the Catalan branch of Spain's CSIF civil servants union, said the risk that salaries will be paid late was a "real worry". "Think of all that people who have to pay their mortgages, the problems they could have with their banks," he said. "We have all the resources to face our obligations," said Junqueras. The Catalan government probably "still has a bit of margin" to pay salaries during the month of September, said Cuenca.